Summary: A strong year, even if it did peter out towards the end. A fine way to start the 1970s — and this project. Two years after the Summer of Love, the hangover had arrived, and that hangover was embodied most thoroughly not by Five Easy Pieces or Woodstock but by Beyond the Valley of the Dolls. 1970’s #1 movies had something to offer youthful audiences (Five Easy Pieces, Woodstock) and less youthful audiences (Chisum, Airport, The Cheyenne Social Club). Forty-one years later, the former category, to no one’s surprise, has held up better. After never having been addressed in Hollywood movies to any significant extent, the Vietnam War made itself felt in 1970, with four war movies among the twenty-one #1’s, a very high proportion, I’d imagine. Unlike almost everything else, war was on the minds of young (M*A*S*H, Kelly’s Heroes) and old (Patton, Tora! Tora! Tora!) alike. In addition, the #1’s featured three westerns, two comedies (a low number, surely), two sci-fi movies, and two exercises in British Victoriana. The only person to play the lead in multiple movies was Clint Eastwood, and they were back to back. Hardly any of the movies were what you would call “thrillers,” although maybe Airport qualifies. None of the movies featured anything like a private eye/homicide detective or had any semblance of a murder plot (Joe, Trog, and Beyond the Valley of the Dolls came the closest). In brief, filmgoers in 1970 were not in a pulpy mood. New York City held uncommon appeal: Several of the movies (The Boys in the Band, Joe, The Owl and the Pussycat, Diary of a Mad Housewife, Love Story) were set at least partially in the city, which probably isn’t true of 1980 or 1990 or 2000, although you never know. (The Boys in the Band and The Owl and the Pussycat featured scenes shot in the exact same branch of Doubleday Books, an odd coincidence.) Ten of the movies were set in the past, and one was set in the future. The more “serious” movies of the bunch addressed homosexuality (The Boys in the Band), feminism (Diary of a Mad Housewife), the new hippie culture (Joe), and anomie (Five Easy Pieces). Beyond the Valley of the Dolls addressed absolutely everything, including — obliquely? accidentally? — the Manson murders. Not too shabby for a bunch of box-office draws. Academy Awards: Remarkably, all five nominees for Best Picture reached #1: M*A*S*H, Airport, Five Easy Pieces, Love Story, and the winner, Patton. Patton‘s George C. Scott won Best Actor and famously refused his award, while Airport‘s Helen Hayes received Best Supporting Actress. Franklin J. Schaffner won Best Director for Patton; Robert Altman was the only other director here who was nominated, for M*A*S*H. Francis Ford Coppola and Edmund H. North won Best Original Screenplay for Patton, and Ring Lardner Jr. won Best Adapted Screenplay for M*A*S*H (Love Story, Joe, Five Easy Pieces, and Airport were among the eight other nominees in those two categories). Woodstock won Best Documentary — it must quite unusual indeed for the Best Documentary winner to reach #1. 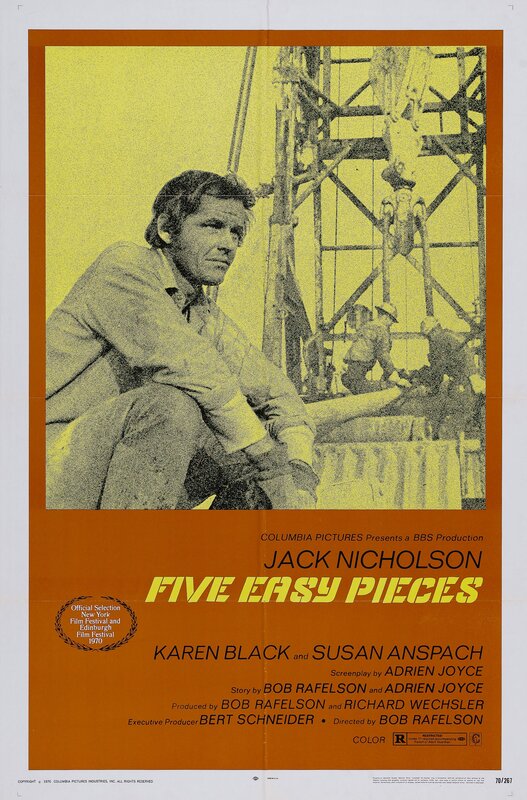 Get Five Easy Pieces at Amazon! Sadly, I can’t vote until I’ve seen at least a few more of these movies, but bravo for a solid, fascinating (and zippy) start to an ambitious project!